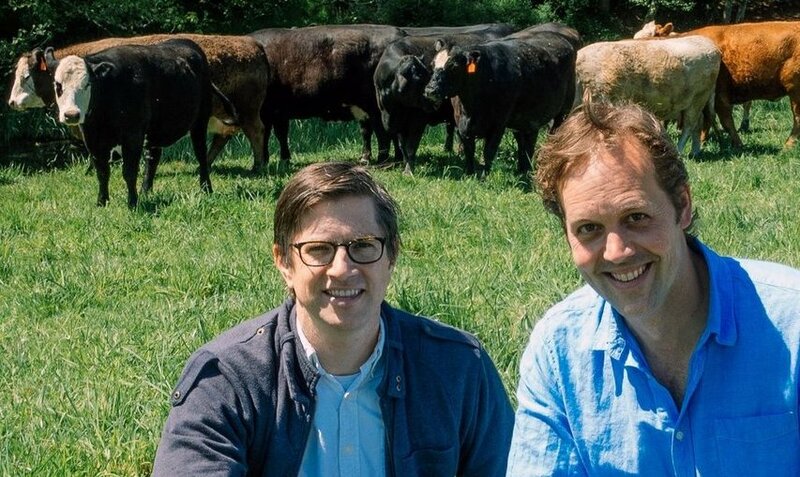 Crowd Cow co-founders Joe Heitzeberg (left) and Ethan Lowry. In the beginning, there was the wacky (brilliant, in retrospect) idea that foodies, picky eaters and even animal rights advocates would be willing to crowd-fund the purchase of their own beef. Not anonymous chunks and slices, not even from the best butchers, but the whole animal. It wouldn't really be a cow, of course, but a steer. Still, for the two guys who put the concept together, it was a risk. Assuming you could even find a rancher who was raising his cattle to their exacting standards, the market isn't set up to sell one head of beef at a time. But they went ahead anyway. The duo, Ethan Lowry and Joe Heizeberg, were understandably nervous; no one had ever tried to crowd-fund the purchase of a single animal. They hit "Send" on their email to Facebook friends and people who had expressed an interest in their venture and waited. That was then. Today, with Crowd Cow, they sell 150 animals a month. Not just the prime cuts, either. What goes fastest, it seems, are the bits that conventional butchers don't bother with: oxtail, for example, and tongue as well as soup bones and marrow bones. "We don't get the cheeks from all our butchers, but sell those, too, when possible," Lowry says. They're working with dozens of producers, Lowry told me, ranging from purebred, grass-finished wagyu to grain-finished angus cattle. "Some farm's beef is rare and only offered once per year, and for others we might have some available every other week." But beef -- even the best beef -- isn't for everyone. Crowd Cow needed more. Fish? Maybe, down the line. For now, they're settled on chickens. Their new product is called Pasturebird. Raised on a farm outside Murrieta, Calif., two hours from Los Angeles, the chickens are part of a larger agriculture and livestock ranch that incorporates humane practices, itself a crowd-funded operation. Hyperbole aside, "Pasturebird is one of the best poultry products I've had in a long time," says Eric Klein, VP Culinary at Wolfgang Puck. "Thank you for treating your animals with respect." If all you've ever eaten is grocery store chicken, or, worse, KFC, "the first bite of Pasturebird chicken will be nothing less than magical," the company says. Pasturebird Farm birds are higher in Vitamin A, D, E, Omega-3, and lower in fat than what you can buy at the store. They're never given vaccines or antibiotics -- only locally milled feed and as much grass and bugs as they please, because their whole lives are spent outside. This page contains a single entry by Cornichon published on February 3, 2018 11:00 AM. French Staff of Life seeks UNESCO protection was the previous entry in this blog. Amazon Prime sends love bouquet to Whole Foods shoppers is the next entry in this blog.